The United States Congress designated the Pleasant View Ridge Wilderness (map) in 2009 and it now has a total of 26,839 acres. All of this wilderness is located in California and is managed by the Forest Service. Pleasant View Ridge Wilderness, designated in 2009, has a total of 26,757 acres. This wilderness area is located roughly 30 miles northeast of La Canada, north of the Angeles Crest Highway where the San Gabriel Mountains slope north to meet the Mojave Desert. 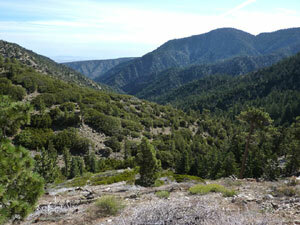 The Pleasant View Ridge Wilderness is also located within the newly designated San Gabriel Mountains National Monument. This area is known for its majestic peaks and spectacular views of the San Gabriels and desert basin. Trails Burckhardt (10W02 High Desert National Recreation Trail), Islip Saddle (9W02), and the Pacific Crest Trail go through this wilderness. Planning to Visit the Pleasant View Ridge Wilderness? How to follow the seven standard Leave No Trace principles differs in different parts of the country (desert vs. Rocky Mountains). Click on any of the principles listed below to learn more about how they apply in the Pleasant View Ridge Wilderness.